Author’s note: I’m neither a physician nor a licensed nutritionist. All of the information that follows is based on my 20+ years’ of personal experience as a vegan runner and my 10+ years as a marathon coach, input from my nutritionist, and a great deal of research done over the years. For a veteran runner like me, spring means one thing: the official kick-off to race season. Shamrock Shuffles, Spring Flings – every city seems to be putting on a race. Over the past two decades I’ve noticed something else – as the number of running enthusiasts has gone up, there is still a shadow of doubt that people can complete endurance events on a plant-based diet. How can this be? There are some well-known vegan athletes out there proving every day that a plant-based diet isn’t just possible, but many argue even preferable, for athletic success. Carl Lewis, Brendan Brazier, Martina Navritilova, and Scott Jurek come to mind. They’re amazing! In fact, they have such amazing athletic prowess that frankly, they’re a bit intimidating. Are they super humans who could excel no matter what they eat? I doubt it. I may not be as athletically gifted as one of them, but I am a vegan athlete. I’m a perfectly ordinary person with average athletic abilities, a serious running addiction and several marathons under my belt. I’ve been running for more years than I can count, and have done it as an omnivore, vegetarian, vegan, high-raw and 100% raw vegan. I’ve learned the hard way – both monetarily and physically – that it doesn’t take fancy protein powders, vitamin drinks, or energy gels to get enough fuel in my diet to finish a race successfully. I listen to my gut (figuratively and literally), use common sense, and make any changes gradually. Below are the most common questions I’ve encountered from other athletes who are contemplating a veg*n diet. Some of these are more specific to endurance training, but I know we have some athletes out there (at least a couple of us are derby girls!) so I’m including all of them. How do you get enough protein to stay energetic and recover? This is the most common question I get, and also the most frustrating. The simple answer is that protein is in everything! You don’t need to eat a steak – or a block of tofu, for that matter – to get an adequate amount of protein. As long as you’re eating a balanced diet that includes nuts, seeds, legumes and whole grains, you should be covered. In fact, healthful fats and carbohydrates are just as important for strength and recovery as protein is. But what about amino acids? Don’t they have to be in a certain ratio? Don’t you need to eat a ‘complete protein’, like dairy or eggs? The short answer is that there are many plant-based foods such as quinoa, amaranth, hemp seed, and soybeans that are complete proteins (they contain all nine of the essential amino acids). The longer answer is that you do not need to consume all nine amino acids in one sitting. As long as you are eating a varied, whole foods diet, you should be fine. How do you get enough fat in your diet if you aren’t eating dairy or eggs? Not only do I get enough fat, I have to be mindful that I don’t eat too much – especially when I’m not training for a race. Many nutrient-dense foods such as nuts, legumes, avocadoes and coconut oil have plenty of fat. Don’t all of those fruits and vegetables upset your stomach? The key to training on a plant-based diet, especially high- or 100% raw, is moderation. If they don’t upset my stomach when I’m not exercising, then it stands to reason that they won’t upset it when I increase my activity level; I just need to increase it s-l-o-w-l-y. Everyone’s threshold is unique, but for myself and many people I’ve coached, it’s reasonable to increase activity in 30 minute increments. More than anything, timing is the culprit. I’ll touch on that in a moment. Why don’t you use energy bars/drinks/gels? They’re vegan, aren’t they? Some of them are, but there are two reasons I don’t ingest them. One – they are expensive! Two – they are highly processed and full of ingredients that I don’t need to perform well. In fact, as my diet has evolved towards whole foods and high-raw, I actually suffer from GI distress when I do consume these things. The reason energy bars, etc. are effective is because they deliver a shot of carbohydrates, glucose and electrolytes to your system when your glycogen stores are depleted. You can get the same thing out of a piece of dried fruit or a couple of orange slices. How do you get enough calories? One word – smoothies. I have to be careful not to ingest too many calories when I make my recovery smoothies. However – unless you’re training for a lengthy endurance event (longer than 4 miles or one hour), you shouldn’t need to take exceptional measures. If you are training for something that’s high-endurance, you should incorporate dietary needs into your training plan, whether you are a vegan or an omnivore. No matter what I’m eating or level of fitness I have, a few things always hold true across the board: what to eat before and after a workout; when to eat it; and most importantly, how it will affect my digestive system. How much? When eaten slowly, just enough to make me feel full. When? 90-120 minutes prior to my run (or hike, or bike ride, etc). What? Pre-run: a combination of complex carbs, protein, and fat. Post-run: the same, but with more carbohydrates and water. Pre-run meals that work well for me include: 1 banana + 2 tablespoons nut butter; ¼ cup coconut yogurt + 1-2 tablespoons granola; ½ avocado spread on a piece of toast or some raw crackers; ½ cup hummus + some raw crackers; ½ cup quinoa garden tabbouleh. Post-run meals that work for me are always in smoothie form. It’s important to replenish one’s glycogen stores and protein as quickly as possible (ideally within 30 minutes of your activity). My recovery smoothies always include a handful of berries, a handful of tropical fruit (banana or pineapple), a bunch of greens, and alt milk or yogurt. If I’m not anywhere near my blender or I’m eating out, I opt for a tofu scramble or a really big salad that includes beans or tofu, nuts, and a side of fruit. 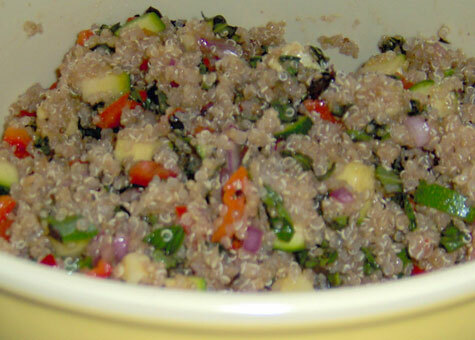 It is very important to rinse quinoa before cooking it, otherwise it will taste quite bitter. This is due to saponins that coat the quinoa seeds. Even after the seeds are polished and packaged, residual saponin dust often remains. In a large bowl, combine red onion and allspice; set aside. [If you prefer using cooked quinoa] Bring a large pot of salted water (6-8 cups) to a boil; add quinoa and cook, stirring frequently, until quinoa is al dente (start checking after 10 minutes and watch for the halos to appear). When quinoa is done cooking, drain and set aside to cool. Prepare and add the remaining ingredients in the order listed, then mix together. Fold quinoa into the other ingredients. This salad can be served at room temperature, but also tastes great straight out of the fridge! Monika is a Chicago expat who recently left life in the fast lane for 15 acres in rural North Carolina. An avid foodie, she has developed and tested recipes for several veg*n cookbook authors. In addition to being food-obsessed, Monika is also a micro farmer, runner, coach, writer, yogi, voracious reader, wife, and mum to a very precocious three-year old. You can follow her musings at windycityvegan, or check out her virtual recipe collection at Chew on This! Thanks for the great post! My husband and I recently started eating more raw foods and training for our first 5k. Thank you for posting the recipe and other food tips!! What I liked about this post is Monika doesn’t emphasis soy products. I can’t digest soy or gluten for that matter and find it even more challenging to get protein into my diet, thank goodness I can eat beans. Many people on a vegan diet fall back on soy products for protein but what if you can’t eat soy, that’s always been my thought. 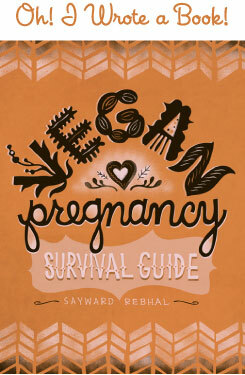 I mostly frequent vegan blogs because of my dairy allergy (vegan mac and cheese omg) but this was really useful! I have a chronic illness and high metabolism that means I am constantly eating, and recently I’ve actually found that plant-based foods actually keep me fuller longer than a ton of meat or fat (my usual fallback). So thank you for this post, Monika! @Carey I wish I could “like” your comment, I agree–a wide and varied diet =/= only soy protein. I am not a runner but just reading this makes me consider it. All of your food choices sound so good and you are so inspiring. Love the picture of your daughter, she looks so happy running along with Mama! I second that! Great picture :) and great post! I am a runner too and I’ve actually been wondering about hydration. Recently, I’ve been reading that in general we aren’t supposed to be drinking as much water as they usually recommend…do these recommendations apply to runners? Also! Is there something you have during races? (I know you said dried fruit). The longest I’ve run is a half-marathon (I’m going to train for a marathon in the fall I hope!!!) and I always seem to hit a wall at 8 miles. I swear that little gel pack during the race got me through it but it could have been a placebo effect. What do you recommend? Excellent post. I always like to throw out names of vegan super star athletes to people who question the vegan diet. I, too, share Carey’s sentiment. I can’t tolerate any soy and have a moderate intolerance to gluten. And depending on the day, beans make my tummy upset too. Oh my! It’s great to see the soy and gluten free recipes out there. @Carey @treesa: I have worked so hard not to let my family fall back on processed soy or gluten products for their protein. None of us has a soy allergy, but we limit our soy to edamame and the occasional bit of sprouted tofu. My husband and I both have a gluten sensitivity, so I keep gluten out of our diet as much as possible, too. The only exception to that is Field Roast grain-based sausages. Totally worth keeping any other gluten out of our diet to eat FR in a blue moon! Otherwise, I just make all of my own mock sausages, etc from scratch. @treesa: There is an amazing powdered/instant mac & cheese mix out there, it’s cashew-based. Let me know if you want the link to the recipe! @Amy @Sara: I love that picture, too! Pure joy and unbridled energy. @Sara: The best way to measure your input (hydration) is to measure output (urine). Your urine should always be a pale yellow – not clear, and never dark yellow or brown! There is water in everything, so unless you never eat fruits or vegetables, counting the numbers of liquid you consume is not an accurate way to ensure hydration. In fact, it can lead to being over hydrated, which leads to hyponatremia, which is extremely dangerous. Also! Those gels you’re using are not having a placebo affect, and you should probably be taking something by the time you’ve been running for 60-90 minutes to ensure you don’t completely deplete your glycogen stores before you hit the wall. During a half, most people take their first gel somewhere between miles 4 and 6. I take two dried apricots in place of each gel packet, and it works very well for me. I’ve used vegan jelly beans in a pinch. And I’ve even had success with salted pretzels. Whatever you decide to use – be it GU, dried fruit or something salty, you want to drink some water with it. Nothing is worse than that stuck-in-the-throat feeling while you’re trying to run! @Moira: There is a new website, xgfx (http://xgfx.org/), that’s dedicated to Vegan, Gluten Free recipes. I think there are a fair amount of soy-free recipes on there too. Also, I’ve had a lot of luck with raw websites for recipes and inspiration. And in the spirit of full disclosure, I belong to and submit recipes to this site. But even if that weren’t the case, xfgx is awesome! @Sara: I meant to say ‘counting the number of ounces of liquid you consume.’ Hope that makes more sense than ‘counting numbers of liquids’! I love all the talk on this post! Maybe we should have more articles on athletics/running? @ Monika: Thank you! Yes, I think that is a great way to think about it. I can’t wait to get training again. I so *love* this post! It brought me out of lurking mode to actually post! I love reading about vegans taking up running! I’m a vegan ultrarunner with countless ultra finishes anywhere from 50K to 100 miles 48 hour races and I swear being vegan is the only way I can do it. Recovery is so much faster compared to my meat eating friends and I don’t get injured or sick nearly as often as they do too. I run my best when I am 90-100% raw and mostly I fuel with dates and cold watermelon. A little baggie of dates is super easy to carry on a run and the sugar is a fantastic boost. I must have my fruit smoothie both pre and post run too! I can’t wait to direct people to this post.. super informative and well written. @Coleen: Oi! I never thought about cold watermelon, and that sounds sooooo good right now. I usually carry dried apricots, but like the idea of dried dates even better. Thanks for the great feedback!